The Kia Venga is the second compact MPV in the Korean car maker's line-up. It's very sensible. Not satisfied with one small MPV-like model in its line-up in the guise of the Soul, Kia also offers the Venga. While the Soul is all pseudo-SUV in its looks, the Venga is more conservative. It's got a little bit more useable interior space as a result, and comes with the same high driving position that appeals to buyers of such diminutive MPVs. 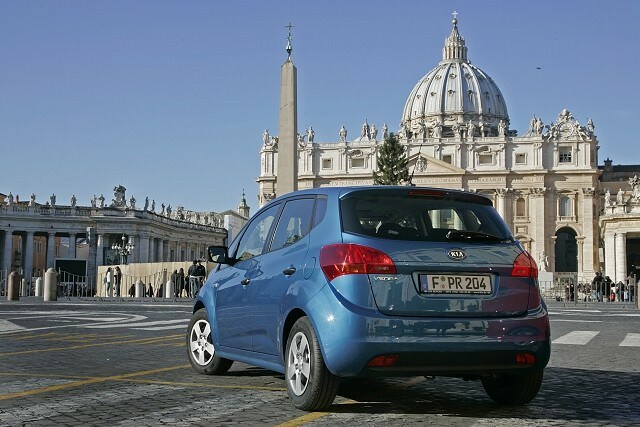 Arriving in 2010, Kia's Venga is built in the company's Slovakian factory alongside its Kia and Hyundai relations. A short, tall hatchback, the Venga focuses on space and practicality over everything else. Like all of Kia's recent models the fit and finish is good, though erring on the side of functional rather than exciting. That's pretty much true of the entire car; it's useful, if uninspiring, and to drive it's ordinary too. There's the lofty driving position so favoured by buyers of such compact MPVs, though the Venga loses out in ultimate practicality over some rivals with its rear seats not offering quite the impressive range of split/fold and tumble options. Indeed, fold the seatback down and they don't fold flat, limiting its outright practicality. Front-wheel drive, the Venga comes powered with a choice of 1.4- and 1.6-itre engines. There's a 1.4-litre petrol with 90hp and a 1.6-litre with 125hp, or a pair of diesels in the same 1.4- and 1.6-litre capacities with 90hp and 128hp respectively. The 1.4 and 1.6 petrol engines come as standard with five-speed manual transmissions, the diesels coming with a six-speed unit. If you want an automatic only the 125hp petrol engine is offered with one, a four-speed unit. If you're after the automatic be aware that it increases fuel consumption and bumps up CO2 output from 144g/km for the manual to 164g/km, which means a jump in your annual motor tax. Look out for EcoDynamics badged cars as they include stop-start, which improves CO2 emissions and fuel consumption on both petrol and diesel models. Kia's history as a budget brand means specifications are typically generous; all but the base level trims get air conditioning and aux-in connectivity. Significantly for used buyers, Kia's seven-year warranty is transferrable between owners, meaning some peace of mind even on older models. If you're planning on using it as a run-around rather than a big-kilometre family machine then the 1.4-litre petrol engine is more than adequate. If you can find an EcoDynamics model all the better, as its drops CO2 emissions from 147g/km to 136g/km saving around €110 a year on your motor tax. An entirely sensible, small, but spacious mini-MPV that should be reliable and worry-free thanks to Kia's long seven-year warranty. Not exciting, but then practical family motoring rarely is, the Venga is well worth a look if you need space in a no-nonsense package.